Puts OSHA's workplace safety regulations in a reader-friendly format. 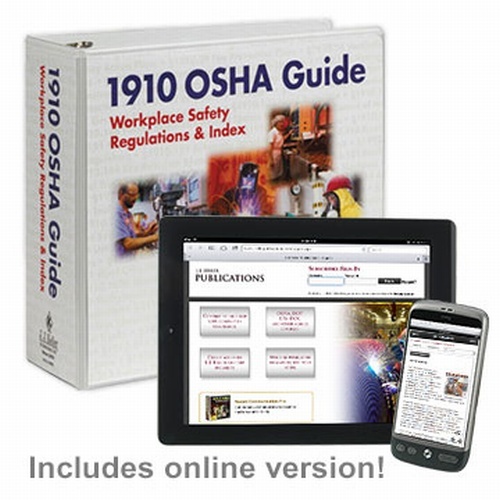 Using this convenient reference, you'll have quick access to OSHA's word-for-word Part 1910 workplace safety regulations. The 1910 OSHA Guide is tab-divided for easy searching ... it's designed to help you find key OSHA requirements and make sure you're complying with them. Loose-leaf, 3-ring bound, over 1,200 pages. The guide also covers OSHA's Part 1903 requirements for inspections, citations and penalties, as well as Part 1904 requirements for recording injuries and illnesses. A detailed reference section provides contact information for OSHA offices, consultation services, and associations.